A Redditor claims to have access to a Canadian database in which the upcoming LG G8 ThinQ is shown alongside the number 1199. Assuming this figure is its price in the country, this means the phone could cost about US$900 at launch. Considering LG's typical release strategies for its mobile devices, this is more or less plausible. A Redditor named livedadevil has posted what is claimed to be a shot of a Canadian SKU database. 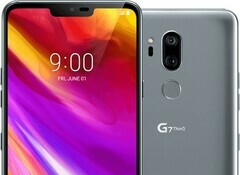 The image shows that a product called the LG G8 ThinQ 128G has been added to it. The right-most column of this read-out has the number 1199 across from this term. This, then, could be interpreted as an entry for the LG G7 ThinQ's successor, which has 128GB of RAM and will be sold at CA$1199 by the relevant company. Should this leak prove valid, it could indicate that LG will launch this device with a starting price of approximately US$900. This may sound daunting, but the OEM is an old hand at sticking tags of this magnitude on new smartphones. For example, the LG V40 ThinQ has just been released for pre-order in the US with a total retail price of $949. In addition, the LG G7 ThinQ also started at approximately $750 in North America. However, this strategy quickly resulted in consequences such a move to offer the phone with a free 4K TV in Canada. In addition, the company has been observed to rapidly drop its flagship prices in order to maintain interest in them. However, ultimately, time and the G8 ThinQ's MWC 2019 release will tell.